Today I came home in the afternoon and wanted make something different for lunch. I rummaged around the kitchen to see what I have at home and then I saw the Sweet Potatoes. When I see sweet potatoes I am reminded of the dish my Mom used to make at home. But today was not the day for that recipe. Remember I wanted something different!!! So I decided to come up with something on my own. I decided to call this recipe Savory Sweet Potatoes. I basically came up with the recipe based on whatever was there in my refrigerator. 4 six-by-six inch square aluminum sheets. Bake the sweet potatoes in the oven (heated to 400 deg F) for 30 – 45 minutes or till tender. Chop the green onions, red pepper and green chili. Mince the ginger and garlic together. Heat 1/2 tsp Olive oil in a saucepan. Toss in the chopped green chili and fry till brown. Add 1/3 cup of chicken stock and let it simmer. Add the chopped green onions and let it cook in the chicken stock for 3 minutes. Add the minced ginger garlic and cumin powder. Let it simmer till the mixture is almost dry. Now add 1/3 cup of chicken stock and the red pepper. In the meanwhile cook the peas in the microwave for 3 minutes. If using Paneer: Sprinkle some water on the paneer and heat it in the microwave till it is soft. Once the red pepper has softened, add the peas along with the rest of the chicken stock. Add some salt to taste and let it cook for 2 minutes. Cook it uncovered and keep mashing the paneer to incorporate into the mixture. Let the water evaporate, add the black pepper, mix well and remove the saucepan from the heat. Remove the sweet potatoes from the oven, once tender, and peel off the skin. Mash the sweet potatoes and add the cooked mixture into it. You can refrigerate this till ready to serve. 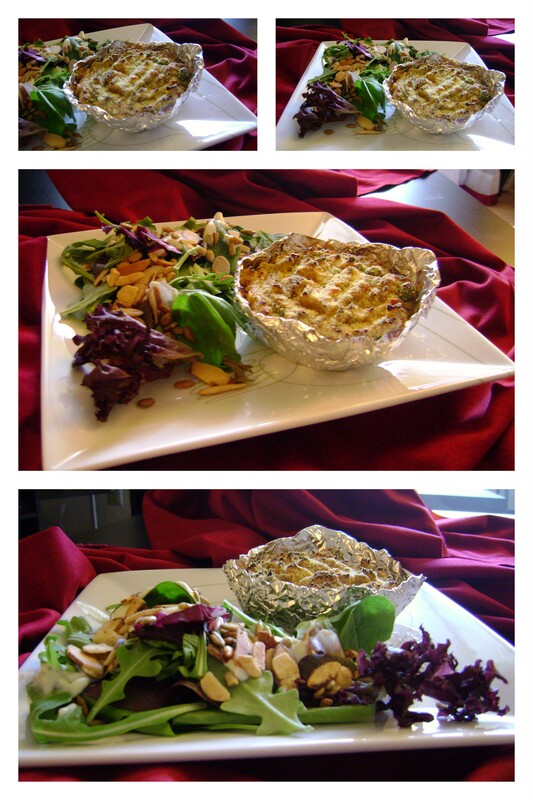 Shape the aluminum foil into small bowls. Sprinkle the 1 teaspoon of corn meal over each serving. Heat the oven to 350 deg F and place the sweet potato servings in the oven for 10 minutes. This entire recipe takes about an hour from start to finish including prep time. I had green salad with some Italian dressing and roasted nuts with the Savory Sweet Potato. You can also serve this dish with some garlic bread. This recipe can be modified to make smaller sized portions and then can be served as an appetizer. Heat the milk in the microwave for 10-15 seconds. You want to bring the milk to room temperature. Sprinkle the gelatin on the milk and set it aside. Whip the yogurt to a smooth consistency. Add the sugar to the curd and whip it to a smooth consistency. 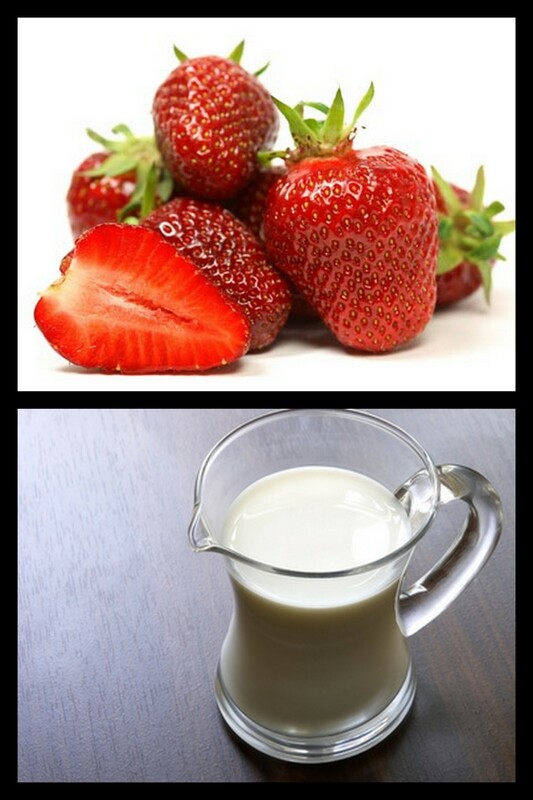 Blend the strawberries with the curd and sugar mixture to a smooth consistency. Heat the whipping cream over a medium heat till it starts to boil. Remove from flame and add the milk and gelatin to it. Stir till the gelatin has dissolved completely. Add this to the strawberry and curd mixture and blend. Pour this into 6 desserts bowls and leave in the refrigerator overnight. Before serving garnish with some chopped strawberries and blueberries. This entire recipe took approximately 30 mins to complete including prep time (+ setting time). This recipe has also been adapted from the ‘Passionateaboutbaking’ blog. 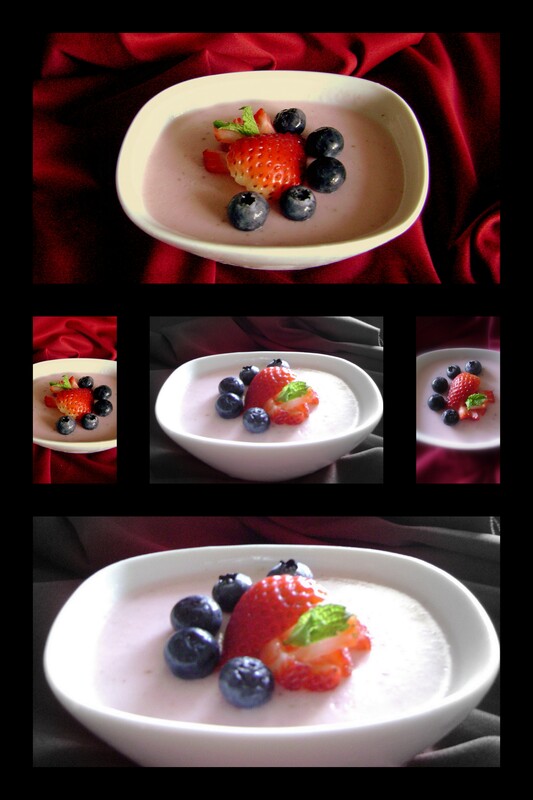 The original recipe can be accessed at http://www.passionateaboutbaking.com/2009/03/strawberry-yogurt-pannacotta.html. The changes I made to the recipe was using a normal blender versus an immersion blender and I used vanilla curd instead of hung curd. A few weeks back I accompanied a friend while she went on her wedding dress shopping. It was an exhausting evening for her what with all the dresses she got in and out of. So we decided to get some dinner before we headed back home. And we landed up at Macaroni Grill. The side of bread and the entrees we ordered there were awesome. We then debated on whether or not to order a dessert and then we ended up ordering one each. I ordered the Panna Cotta with fresh Berries and it was definitely one of the BEST DESSERTS I have ever eaten at a restaurant. Ever since I have been thinking of and contemplating making Panna Cotta at home. Then a couple of weeks back when I went to the store to pick up the ingredients for the Roasted Red Pepper and Tomato soup with fresh basil, I picked up the ingredients to make some Panna Cotta at home. I think this would be an appropriate place to mention a blog I really love. I have made a few of the dishes following the recipes on the blog and they turned out to be amazingly good. The blog is http://www.passionateaboutbaking.com/ and I have adapted my panna cotta recipe from there. The ingredients listed below serves 6-8 persons. Measure 3/4 cup of the whipping cream. Sprinkle the gelatin over the cream and set aside. Mix the sugar and cocoa powder in a sauce pan and add the 2 1/4 cups of whipping cream. Heat the mixture over medium heat to a simmer. Remove the saucepan from the heat and add the chocolate chips and stir to dissolve the chips. 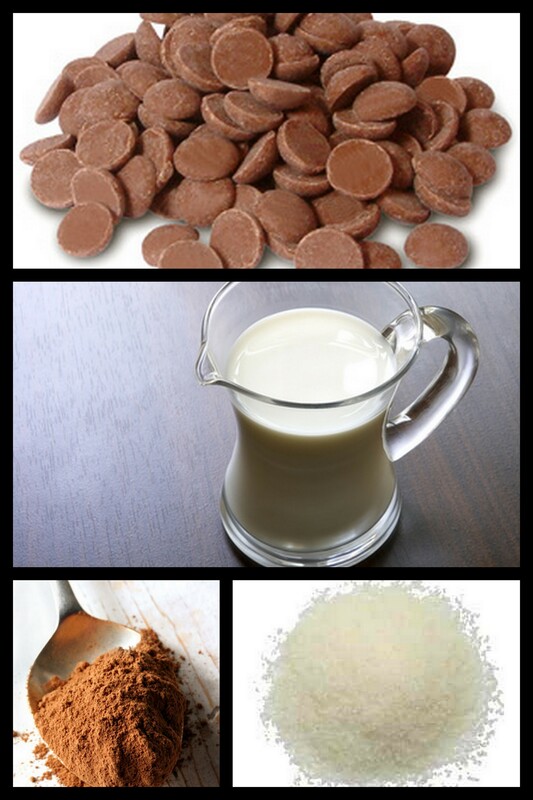 Heat the saucepan on a low flame to dissolve the chocolate to a smooth consistency. Add the softened gelatin and cream mixture to the saucepan and make sure the heat is on low as you do not want to heat the mixture to a simmer. Once the gelatin has completely dissolved remove the saucepan from the heat. Use a fine strainer and strain the mixture into a big bowl. Transfer the Panna Cotta into smaller individual serving bowls. The entire recipe from prep to refrigerating takes about 15-20 minutes. This wasn’t like the Panna Cotta I ate at Macaroni Grill but it was absolutely delicious. But I must warn you this is not for the health conscious foodie. This is one of those sins you allow yourself to indulge in once in a long long while. The original recipe can be found at http://www.passionateaboutbaking.com/2008/04/dark-chocolate-panna-cotta-its-all-about-the-kidz-in-us.html. I adapted it based on some of the ingredients I already had at home. I replaced the dark chocolate with milk chocolate and instead of using authentic cocoa powder, I used the hot chocolate powder. Amit (my husband) was down with a cold the other day and he so wanted to have some soup. So instead of buying the sodium loaded soups at the grocery store, I decided to try making some homemade soup. After a lot of “you decide, no you”, we agreed on tomato soup. 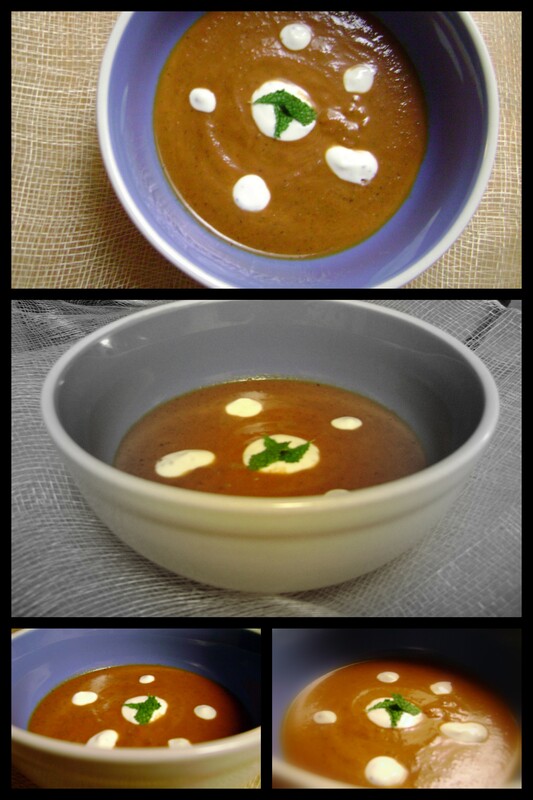 I then found this recipe online for tomato soup with roasted red pepper and fresh basil. The recipe just looked interesting and easy to make. And I can vouch for the fact that it was delicious too. I did make some modifications to the original recipe. 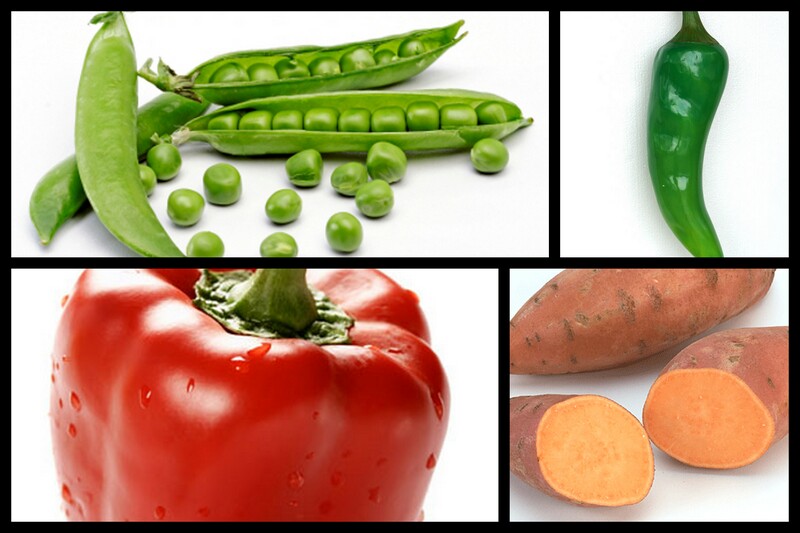 The quantities listed below will serve 3 persons if you are serving just the soup and a salad. We decided to go healthy that night and have a salad and soup for dinner. Slice the red pepper into 1 inch thin slices (slivers). Mix the white cooking wine and oregano with the red pepper and set aside. In the meanwhile chop the garlic cloves and onion. Heat 1 teaspoon of olive oil in a saucepan and add the marinated red pepper. Roast the red pepper till the edges turn brown. Set the red pepper aside. Add 2 teaspoons of olive oil to the same saucepan. Once the oil is hot add the chopped onion and garlic to the saucepan. Saute the onion and garlic till they turn light brown. Mix in the red pepper, crushed tomatoes and chicken stock and bring to boil. Reduce the heat and let the soup simmer for 10 minutes. While the soup is cooking, mix together the sour cream, whipping cream, basil, salt and black pepper and set aside. This soup takes about 20 – 30 minutes to serve including prep time and cooking time. I love to serve this alongside some fresh salad with a ranch dressing. 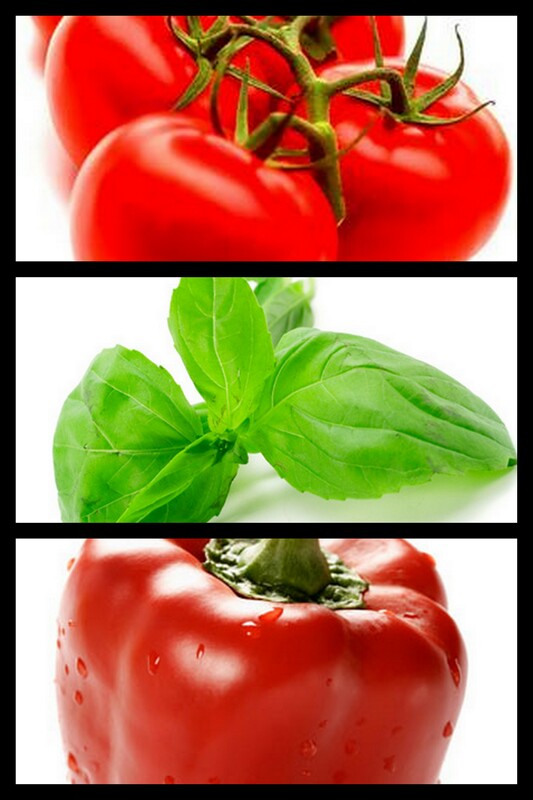 The original recipe can be found at http://www.countryliving.com/recipefinder/red-pepper-soup-basil-cream-recipe?click=main_sr. I only made a change in the red pepper part of the recipe. Instead of buying a can of marinated red pepper I made my own fresh roasted pepper. With the number of people joining and using social networking sites, social media is one huge force. SocialVibe (http://www.socialvibe.com/) taps into this collective power of individuals by connecting people with brands. It allows users like you and me to engage with sponsors just by logging into the social network. You can decide to work for a cause of your choice. It allows you to contribute to something close to your heart by clicking away, but this time to make a difference to someone’s world. You click and for each activity you complete, funds are contributed by the sponsor of the activity. This is my way of trying to make a small difference in this world. I chose the cause ‘Stand Up 2 cancer‘ because it is close to my heart. Today it is very rare to find anyone who has not been affected by cancer, if not oneself, a friend, a relative or an acquaintance. So let’s help fund cancer research so that the generations to come can say that it is rare to find someone affected by cancer. I request all those who do read my blog to please spend a few minutes and click on the widget on the left side of my page to help me help my cause. Thank you, I really appreciate your help.